Jing Guang New World Hotel: The Jing Guang was located in a modern high-rise building and offered very nice accommodations. Our only complaint ... single beds instead of a king. The hotel was clean and safe, the rooms were adequate in size and included telephone and satellite TV. The lobby area was beautiful including a lobby bar and pastry case. 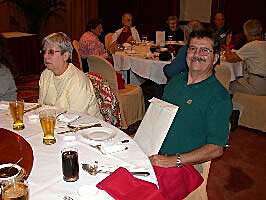 Altogether there were seven restaurants in the hotel offering eastern and western foods. The food served was very good and the included breakfast buffet was more than adequate to start the day. The hotel staff was friendly and courteous, albeit the lines for the safe deposit boxes were extremely slow. 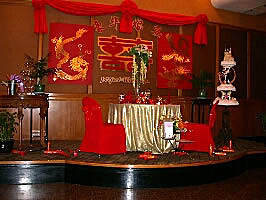 Shanghai Hilton: The accommodations at the Shanghai Hilton were similar to those in Beijing. The Hilton is in a modern high-rise building, has comfortable sized rooms with telephone and satellite TV. I'm not sure as to the number and type of restaurants as we did not eat in the hotel, nor did we spend much time there at all. I do remember there was an Italian restaurant that looked great and an area where you could buy all types of pastries and cakes. 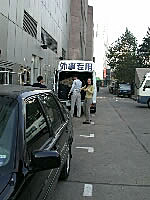 The staff was friendly, courteous and much quicker performing their tasks than in Beijing. The hotel is conveniently located near the Bund with the major expressway and subway right next door. The lobby area was much more active than in Beijing, perhaps because it was smaller. There always seemed to be people going in all different directions. A business office was available for e-mail. Sheraton Xi'an Hotel: Like Beijing and Shanghai, the Sheraton Xi'an was a modern, high-rise building offering all the same services. I did find their TV service to be lacking in English speaking channels though. The one restaurant we had breakfast in was very good and they had a nice gift shop. I'm not sure of the other restaurants in the hotel as we spent very little time in the hotel. A business office was available for e-mail. Guilin Royal Garden Hotel: Of all the hotels we stayed in this one had the lowest rating, but we found it to be almost as good as the others. 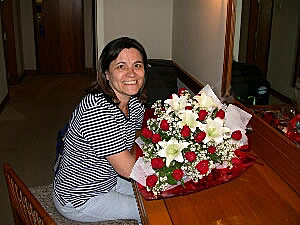 The hotel had a large lobby area with a restaurant, several gift shops, business office and sitting areas. The food served for breakfast and lunch was very good. Our room was large and included telephone and satellite TV services. The only distraction was that our room overlooked the roof of an adjacent apartment house whose residents used the roof to raise chickens and other animals. Occasionally it was a bit noisy, but it wasn't to disturbing. Marco Polo Hong Kong Hotel: If you're visiting Hong Kong you could hardly do better than staying at the Marco Polo Hong Kong Hotel. Located right on the waterfront across from the Star Ferry terminal you had excellent access to the ferry and all the shopping areas of Kowloon. In fact, the hotel, was attached to a very large mall that would take you days and days and days to fully cover. The lobby bar and restaurant was excellent. Returning from a day of touring we enjoyed a hamburger in the lobby restaurant and it was delicious! The room was large and very nice with all the amenities one expects of this class of hotel. 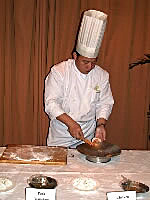 Bangkok Hilton International: The Bangkok Hilton is located in a beautiful park-like setting in the center of Bangkok. Unlike most of the other hotels we stayed in it was not a high-rise with only 7 or 8 floors. The lobby area was beautiful and overlooked the hotel's gardens and pool area. There was a large restaurant downstairs with a very pleasant view of the park also. An upscale Italian restaurant was very good but pricey for Bangkok. Just outside the entrance to the hotel (actually part of the hotel) there was a small pastry and sandwich shop which Anne and I enjoyed lunch in several times. It was reasonably priced and very good. 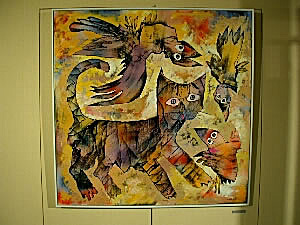 During our stay there was an art exhibition in area adjacent to our room which included a large Koi pond. The hotel was located near a major shopping street and Bangkok's new skytrain elevated railway, however, it was in the middle of a complex one-way road system that took some negotiating to get around because of the traffic in Bangkok. When leaving for the waterfront area you had to be sure the driver left from the hotel's back entrance or it would add up to an hour to your trip. 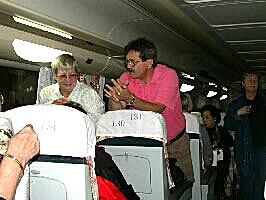 Air travel throughout China was always on modern US or European made aircraft, either Boeing or Airbus aircraft. Many of the airports appeared to be as large as our airports here in the States, however, it was evident that they didn't have the same amount of traffic. 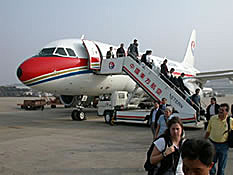 With the exception of the one canceled flight (from Chongqing to Xi'an) all of our flights left and arrived on time. Seating on board the aircraft was all coach with no business or first class, but this wasn't a problem because most of the flights were well under 3 hours. 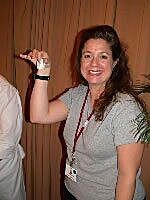 Service was good but, like on US airlines today, limited to the sparse snack. 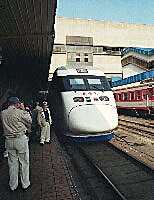 In Shanghai we took a train from Shanghai to Suzhou, about an hour away, our coach was modern and comfortable. As explained to us there were two classes of service: hard or soft seat. We had the soft seats and I didn't observe any cars with hard seats so it's impossible to comment on the accommodations. 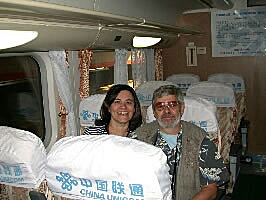 It was a comfortable ride for the short time we were on board and they served hot tea to make the journey go even a bit quicker. 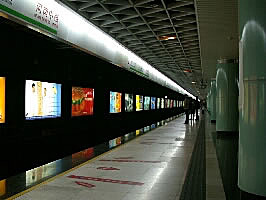 Shanghai: The subway system in Shanghai was modern, clean and fairly easy to negotiate on your own with maps detailing the various routes and stops. We took the subway twice, both times back to our hotel from the Bund, and enjoyed the experience. The subway is much more modern and cleaner than New York's subway system and doesn't serve as a refuge for the homeless and alcoholic population of the city as in New York. 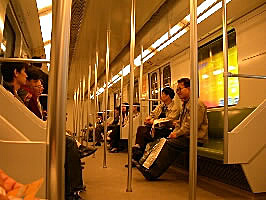 Hong Kong: Hong Kong's subway system is much like that in Shanghai, but I believe a bit older. However, it was modern compared to New York and much cleaner. Sorry no pictures. Bangkok: Since our last trip to Bangkok in 1994, the city has added a skytrain service (an elevated subway). Anne and I tried it out one day and did fairly well, however, we did get a lot of help from some other friendly travelers and the different clerks at the entrances. It, too, was modern and very clean. Sorry no pictures.